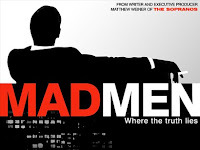 So the entire cast of Mad Men is on Twitter this week. And I mean the entire cast. Not just Don Draper and Peggy Olsen. But Joan Holloway. Pete Campbell. Sal Romano. Paul Kinsey. Roger Sterling. Betty Draper. Bertram Cooper. Bobbie Barrett. And someone named Bud Melman. Who isn't the recently deceased character from David Letterman but (I think) the Jewish guy from the mailroom that they trotted out in the first or second episode to show Rachel Menken, the department store heiress, that they did have actual Jews working at Sterling & Cooper. Bud tweets more than the other characters, serving as a one-man Greek chorus of sorts, and even has his own LinkedIn account. (a) the characters Twitter fairly frequently and in character, with references that play across the board (e.g. everyone will give their own take a on a big meeting that's going down.) They're also interacting with fans via "@" messages quite frequently, something many non-fictional adland characters could do more of. Whatever the storyline behind the storyline may be, it's very entertaining and very well done. And since (as we know) entertainment properties are Prom King Brands, especially critically acclaimed ones like Mad Men, there's a whole lot of interest out there for this kind of thing. It's a great illustration of how social media can help bring a show-- or a brand-- to life and create a deeper, more meaningful relationship with fans. UPDATE: (via comment from Phil Gilman) It seems Twitter has started to ban the various characters -- @don_draper and @peggyolsen for starters, as violations of the DMCA (Digital Millennium Copyright Act) possibly based on complaints from AMC. Venture Beat blog has the complete story. UPDATE 4: And as of this evening (still Tuesday, August 26th) both @don_draper and @peggyolsen are back up online. Seems that AMC's agency, Deep Focus, helped to convince them that letting these very popular characters run with it was their best move at this point.